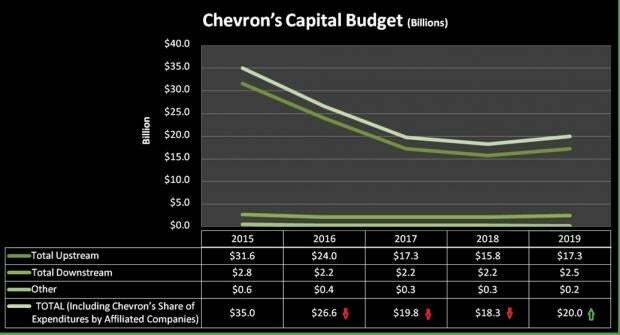 Chevron Corporation CVX recently announced its capital and exploratory spending program for 2019. The budget for capital projects is reserved at $20 billion, higher than 2018’s projected investment of $18.3 billion. Notably, this marks the first budget increase in four years and reflects a 9.3% annual increase. Upstream: Chevron allocated 86.5% of its total budget toward upstream operations. The company has plans to spend $7.6 billion in the upstream projects located in the United States and $9.7 billion in the international upstream projects. The company will use around $10.4 billion to develop and grow its present producing assets, of which $3.6 billion will allocated to the Permian Basin and $1.6 billion for other shale related developments. Moreover, for the major capital projects underway, the company plans to allocate $5.1 billion, of which 84.3% will likely be spent on Kazakhstan’s Future Growth Project, located in the Tengiz field. Chevron plans to fund nearly $1.3 billion for its global exploration. Downstream: Capital spending in the downstream segment is expected to be $2.5 billion in 2019, higher than last three year’s flat budget of $2.2 billion. Of this total amount, 60% will be used for the projects in the United States and the rest will be allocated for international downstream operations. The company’s downstream businesses include refining, marketing and transporting fuels. It also manufactures as well as distributes additives, lubricants, and petrochemicals. Other: The company is expected to spend approximately $200 million, which is 33.3% higher than 2018’s budget, for other activities in 2019. San Ramon-based Chevron is one of the largest publicly traded oil and gas companies in the world. It has lost 3.1% in the past year compared with 1.7% collective fall of the industry it belongs to. Houston, TX-based Cabot Oil & Gas Corporation COG holds a Zacks Rank #1 (Strong Buy). The company’s sales for 2018 are expected to surge nearly 13% year over year. You can see the complete list of today’s Zacks #1 Rank stocks here. Rome, Italy-based Eni S.p.A. E has a Zacks Rank #1. Its earnings for 2018 are expected to grow more than 100% from the 2017 level. Tulsa, OK-based Helmerich & Payne, Inc. HP carries a Zacks Rank #2 (Buy). The company’s sales for 2018 are expected to grow more than 20% from 2017.